Trump nominated Judge Brett Kavanaugh of the U.S. Court of Appeals for the District of Columbia Circuit for the Supreme Court seat left vacant by Justice Anthony Kennedy's retirement. 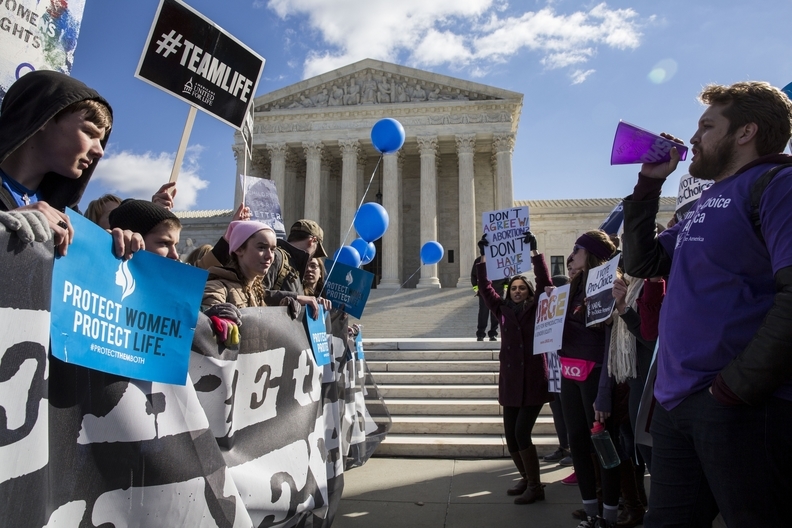 Legal experts are skeptical the high court would overturn the landmark Roe v. Wade decision despite the steady slough of red state legislative restrictions aimed at provoking a major lawsuit to turn abortion authority over to states. One reason, noted Columbia law professor and abortion scholar Carol Sanger, is the medical community, which has largely left the rancorous topic of abortion to abortion providers. "For the states that say, 'I want this to be illegal,' we are back in the day of having doctors having to decide whether to perform legal abortions," Sanger said. "When you have an abortion, is that a crime? It becomes a matter of law enforcement. You would have surveillance, investigations, it would be a whole new world that we have not really had in many states since abortion has been legal." During Kavanaugh's confirmation hearings in 2006, he told the Senate he would uphold the landmark Roe v. Wade ruling. He has since upheld some abortion restrictions. According to data compiled by the Centers for Disease Control and Prevention—which gathers abortion data from most states—hospitals have maintained a small but steady role in providing abortions, and they perform the majority of the procedures at 20 weeks gestation or later. More than two-thirds of hospitals will perform abortions at 20 weeks compared with 36% of abortion clinics, according to a peer-reviewed study from 2011 and 2012 from Women's Health Issues. About 4% of the total number of abortions happened in hospitals, while 1% were done in physicians' offices, which perform fewer than 400 abortions a year; 31% took place in "nonspecialized" clinics where fewer than half of patient visits are for abortions. The data showed roughly the same numbers for hospitals in 2011 and 2014, the latest year for a nationwide analysis of abortions. Hospitals have generally avoided engaging in the abortion debate since the Supreme Court decided Roe v. Wade in 1973. State hospital associations stay at arm's length from their legislatures' work on the issue, particularly since many large systems are Catholic. Specialty clinics perform the lion's share of the procedures, and anti-abortion activists home in on Planned Parenthood and other stand-alone clinics. All but seven of the state's 42 abortion clinics—only two of which had met those requirements—closed. Of the 55,287 abortions performed in Texas in 2015, nearly 26,000 were done in designated ambulatory surgery centers compared to the nearly 28,000 performed in specialty abortion clinics. Hospitals accounted for 139 abortions that year, and physicians' offices for 45, according to the data collected by the state's health department. Medical abortions administered through telemedicine have spread in rural areas especially, in states whose laws have tamped down on stand-alone abortion clinics. A 2015 Iowa court decision struck down the state's ban on abortion-via-telemedicine, which lets a physician conduct a webcam interview with the woman seeking an abortion and instructs her on how to take one of two pills while describing side effects. The following day, the woman would take the next pill. The Iowa Legislature dictated that a physician would have to be present in the room while the pill is administered. Ultimately the state's Supreme Court squashed the law using what some legal minds call the vague litmus test that has sprung from the Roe ruling: that it placed a substantial obstacle in the path of a woman seeking to exercise her constitutional right. "This is an area where clinics are very affected if more states were to do this," she said. "It would be a good case to go to the Supreme Court, but it also might not be the kind of case a conservative court would take, because it doesn't sound that bad." Law professor Robert Nagel of the University of Colorado said that the intensity of the debate, which drives the mainstream medical community to try to avoid it at all costs, comes from the way Roe legalized abortion through a constitutional ruling rather than the longer-term legislative compromise that has marked other developed nations' approach to their abortion laws. "If anyone looks at the early studies that were done following Roe, there are some very, very telling and interesting studies that show the fervent, uncompromising anti-abortion movement really got its start when Roe v. Wade was decided," Nagel said. "What happened with Roe, these studies show, is that it made the issue a matter of defining who you are. If you are pro-life and you are living in the constitutional system, you fundamentally object to a constitutional right. That inflamed people." "Their sense is that once you declare it a right, you can declare it not a right, that is the fear now," Nagel said, noting that he believes this is the reason a continued Republican-majority court will continue to uphold the law. "For the people who are horrified at the prospect, their perspectives on this are very narrow," Nagel said. "We should look at other progressive societies. Take a look at New Zealand, where there is a long-term progressive society and it allows far more legislative restrictions on abortion than we do. It's not the end of the world; they fight these things out in responsible ways in their legislature and detailed laws and regulations."